← White Chocolate Cupcakes with White Chocolate Cream Cheese Frosting for a Virtual Baby Shower! How is everyone’s week going? Mine feels long. REALLY long. I’m not sure why…Whole30 is going well and physically I’m feeling good, but I’m tired! Can’t wait to see the results at the end of the month. Meanwhile, this post isn’t helping curb my appetite very much. I miss pasta! This is a great springy pasta dish that’s perfect for a quick weeknight meal, or even for company. You won’t believe how easy it is! Cook pasta according to package directions. Drain and reserve 1/2 cup of cooking liquid. 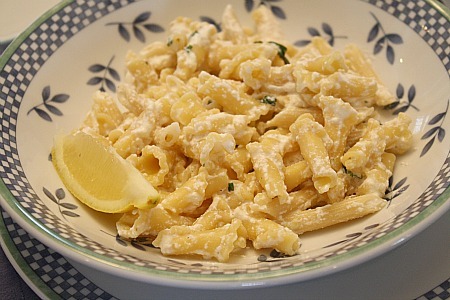 Combine ricotta, lemon rind and juice, basil, salt and pepper in a bowl. Add reserved cooking liquid a little at a time, making sure the mixture isn’t too watery. Add pasta and toss to combine. Garnish with lemon wedges and serve immediately. 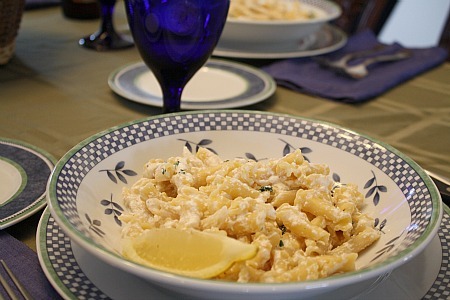 This entry was posted in lemon, main dishes, pasta, QuickAndEasy, ricotta. Bookmark the permalink.